Product information "AC Sensor Controlled Relay"
The Sensor Controlled AC Relay can control the electrical power to devices managed over the Internet. 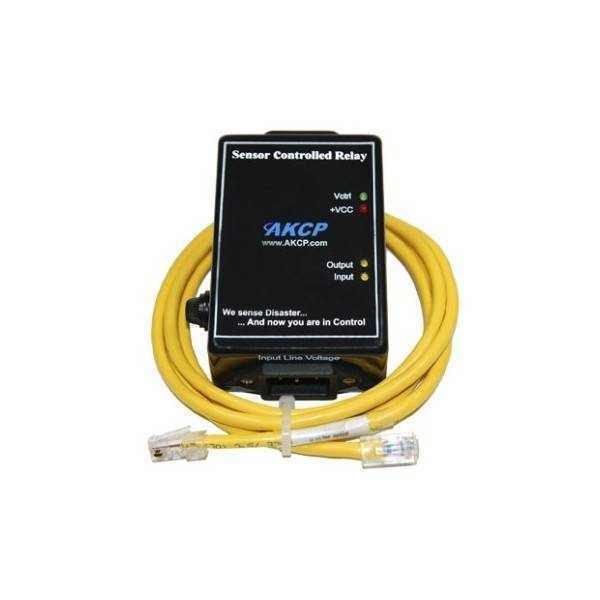 With easy configuration and integration with the AKCP sensorProbe product series. The Sensor Controlled Relay defines a new era in energy management. 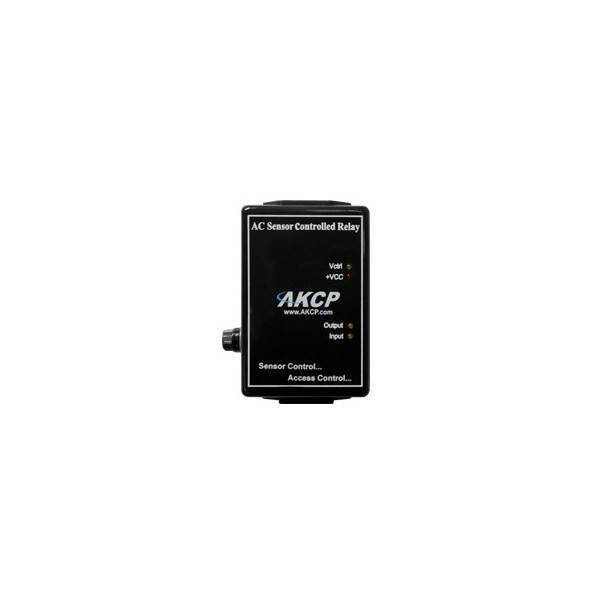 The Sensor Controlled AC Relay is easily controlled by any of AKCP’s extensive selection of sensors. The relay can provide automatic responses to sensor alerts. This is useful, for example, to switch on the fan when the room temperature rises beyond the threshold level or to turn on a light when the motion detector is triggered. Setting up the Sensor Controlled AC Relay is easy with its built in autosense feature and user friendly web interface. The Sensor Controlled Relay can also be controlled via external computers using the included snmp command line utilities either interactively or programmatically. In addition the Sensor Controlled Relay can be controlled via the integrated we interface on the AKCP sensorProbe. The Sensor Controlled AC Relay includes Metal Oxide Varistors (MOVs) and Snubber circuits to protect the open contacts of the relay from high voltage spikes or noise transients. It monitors the power and load & will accept a control signal which is sent from the AKCP sensorProbe or securityProbe base unit. A simple, point and click web manager can set link the Sensor Controlled AC Relay to a sensor. When the sensor goes to the chosen state, for example, High Critical, the Relay can be made to Cycle, which will turn on and then turn off the external device for the selected period of time. In this case, when the sensor goes High Critical, the automatic response system will Cycle the relay for 20 seconds. Users can easily change the fields in the Relay Settings Menu according to their needs using the dropdown list boxes. The Sensor Controlled AC Relay with the automatic response feature can give the users more flexibility in responding to the environmental alerts. Automatic response eliminates the need for the user intervention during the alarm condition. The Sensor Controlled Relay has a built in fuse that provides protection for the external devices from possible damage due to over voltages or high current. Relay designed to control mains line voltage – 110VAC, in the US, 220VAC in the EU. Metal Oxide Varistors (MOVs) and snubber circuit protect the open contacts of the relays from high voltage spikes. 4 LEDs indicate the status of the Relay, Power Supply, AC Line Voltage and AC Load Voltage. Up to 2 Sensor Controlled Relays per sensorProbe2. Up to 8 Sensor Controlled Relays per AKCP sensorProbe8, securityProbe, securityProbe 5E or E-sensor8 expansion module. Note: There are two versions of the sensor controlled relay, 110V input for USA supply voltages, and 220V for EU supply voltages. If you are unsure about which product to order, please contact us at support@akcp.com. See our price list for ordering details. Normally Closed is suitable for supplying power to systems (for example, turning off and on power to equipment with a sensor). Related links to "AC Sensor Controlled Relay"
Customer evaluation for "AC Sensor Controlled Relay"